Most people think having a yard is the first step of having a garden, but inside container gardening is perfectly acceptable for a useful and attractive herb garden. If you were to ask most people how to grow herbs, the first step would include having a nice plot of ground in the yard. However, this is by no means necessary; a kitchen garden window can be just as effective and enjoyable, and many times even more so, especially for apartment dwellers or during those times of year that plants tend not to do well outdoors. With minimal effort, it is easy to have all the benefits of indoor plants, which purify the air and generally lend to a sense of well-being, as well as having fresh herbs at hand for cooking or as medicinal herbs. Some herbs simply do not do well indoors; some notable ones are those that grow large and have equally large root structures, and which therefore require pots large enough that they are not really feasible for most indoor gardens. Dill and coriander are some such herbs. 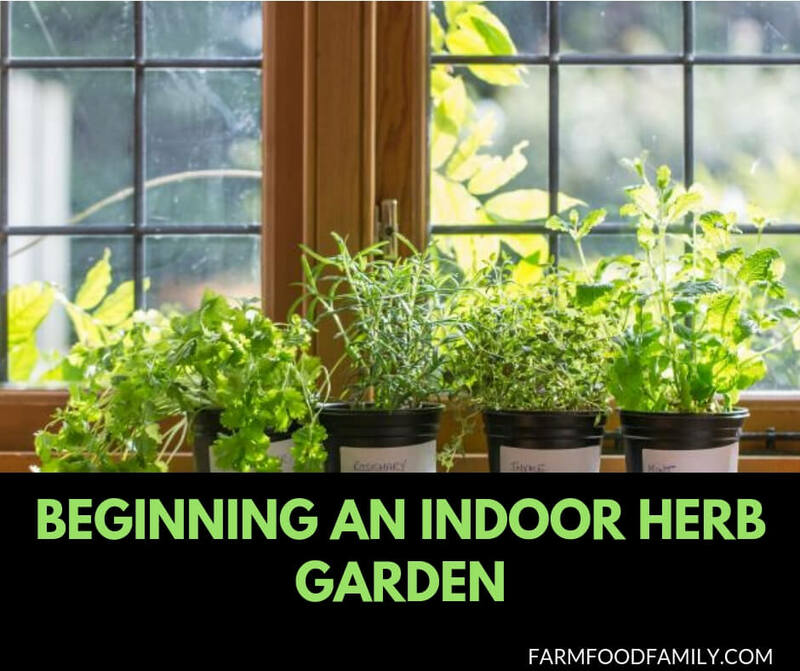 There are plenty of herbs that will grow happily indoors, however. Some of the best choices are angelica, basil, chamomile, chives, dill, fennel, geranium, lavender, mint, oregano, parsley, rosemary, sage, and thyme. All herbs need a minimum of a 5 inch pot, and the larger the pot you can manage, the happier – and larger – the herb plants will be. Some herbs, notably rosemary, basil and mint, can quickly outgrow smaller pots, and will benefits from being transplanted to a larger one, though it is not strictly necessary, especially if you clip from and use them frequently. Having the right growing medium is very important for a happy and successful herb container garden. Many people even recommend a soilless potting mix, or even a hydroponics unit, such as the AeroGarden. However, simple potting soil can of course be used. Because most herbs prefer well-drained soil, when preparing pots with regular potting soil, a layer of gravel about an inch deep should be put down first. Similarly, course sand or perlite should be mixed with the soil, especially herbs that prefer drier, sandy soil, like thyme and lavender. Sufficient lighting is without doubt the most important aspect for a container herb garden. Natural sunlight from a south or west facing window garden that gets a minimum of four to five hours of direct sunlight is best. If that is not possible – and sometimes even when it is – full-spectrum light bulbs can supplement or even replace natural sunlight. However, no artificial light is quite as strong or effective as natural sunlight, and so the required time of light exposure is higher, as much as 10 or even more hours per day. Keep an eye on any herbs grown in an indoor container garden; unusually small or stunted leaves, thin stems, and light or yellowish coloring can all be signs of insufficient light. Proper watering is almost as important as lighting. With only a few exceptions, most herbs prefer well-drained, slightly dry conditions. Always check the soil before watering; if the soil is damp, it is best to wait before watering again until the soil is dry to the touch – though obviously not so dry that the plant begins to wilt. Once a week is sufficient under most conditions. A good fertilizer formulated for edible plants can be used from time to time, but don’t over do it; more is not necessarily better, and over a certain point will not make a plant grow any faster. Once the herbs in an indoor container garden – or an outside one, for that matter – have established themselves and begun to show new growth, don’t be afraid to cut off and use pieces. It is safe to cut up to one third of a plant’s foliage without causing permanent damage. In fact, regular trimming will actually encourage a fuller, bushier plants. In addition, most herbs should not be allowed to go into bloom (with the exception of those herbs that the bloom is the part desired, of course), as it will affect the flavor of the leaves, making them either bitter or flavorless.